Despite the ubiquity of superhero stories in American comics, a large portion of comic-book readers avoid them because the genre can be impenetrable for those who don’t have prior knowledge of superhero history. All-New X-Men is a perfect example of this. The series follows the original five teenage X-Men, who have been pulled out of the past and now live in the present, inhabiting the same world as their adult selves (except for Jean Grey, whose adult self is dead). It’s a concept that is deeply rooted in X-Men history, and much of the emotional impact of the story relies on the reader having a familiarity with what the adult versions of the characters have gone through. Writer Brian Michael Bendis tries his best to inform new readers of all the key events that have defined these heroes over the years, but it can be a lot to take in. First the reader has to accept the time travel stuff, then figure out how these characters play into the current X-Men landscape, which means learning about the different factions of mutants and how they relate to each other and differ in philosophy. That can be a lot of fun for people who love mythology, but it makes All-New X-Men the kind of superhero title that is especially daunting for readers looking for an easy entryway into the genre. At its best, All-New X-Men focuses on how the teenage versions of the original X-Men relate to their present-day selves, but Jean, Scott, and Hank have gotten considerably more attention than Bobby and Warren when the story explores these dynamics. The adult versions of Scott and Hank have had larger roles in the overarching narrative being built in Bendis’ two X-titles, and the legacy of the deceased Jean Grey has loomed large on her teenage self, who has become a much more well-rounded character as she actively fights to avoid a tragic fate. The adult Warren Worthington has undergone so many changes that he’s essentially a completely different character than his teenage self, but Bendis hasn’t spent very much time looking at this relationship. After the lackluster “Black Vortex” crossover event, teen Warren has been cosmically transformed, and in All-New X-Men #40, he explains why he took this huge step. It’s a strong example of how the superhero genre can be used to offer a unique take on deep-rooted emotional issues, and Warren’s eagerness to pave a new life for himself is a more sensational interpretation of the adolescent desire to become someone different than your parents. In the real world, people don’t come face-to-face with their future selves, and during the developmental years, a parent is often used as an example of something to aspire to or move away from. After seeing the person he could become, Warren promised himself that he would do anything that would cause him to radically veer from that course, but his approach to adolescent rebellion is way cooler than what everyday teens do to fight their futures. Unlike Warren’s change, Bobby’s major revelation in All-New X-Men #40 introduces a load of questions for his adult self. After Bobby makes a comment about the hotness of their new teacher, Jean Grey pulls him to the side and asks him why he makes those kinds of comments when he’s gay, outing him because she psychically invaded his most private thoughts. 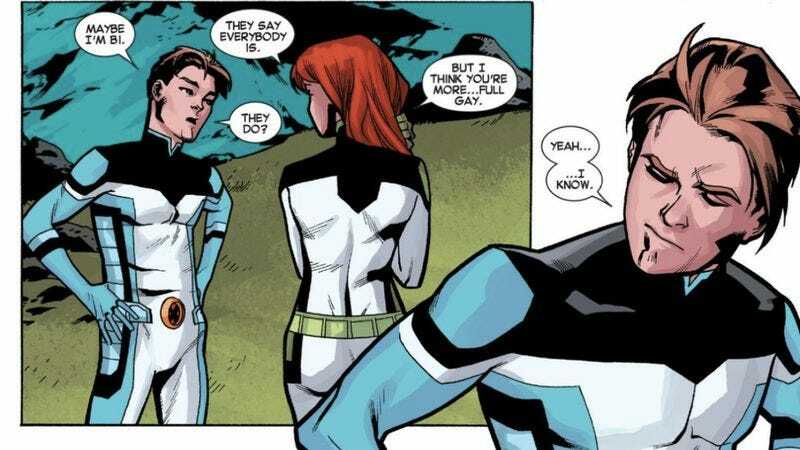 Jean Grey forcing Bobby out of the closet may not be the best way to reveal his sexual orientation, and he’s rightfully angry at her for reading his mind, but Bendis is presenting a superhero take on a scene that plays out between many closeted gay men and their friends that can see through the act. It’s that moment when someone close to you finally asks if you’re gay, but in the case of Jean and Bobby, she’s not asking, she’s telling because she can read Bobby’s mind. Growing up in a conservative family, I spent almost a decade of my life in the closet coming to terms with my sexuality. When friends asked me if I was gay, I lied. Knowing how much happier I was after coming out, a part of me thinks about how nice it would have been to have a psychic friend like Jean Grey, who could see through the lie and force me to embrace the part of myself I kept buried. But there’s another part of me that remembers just how difficult it was coming to that moment of realization, and how angry I was when someone suggested the very thing I was fighting so hard to subdue. Bobby’s coming out scene rushes from anger to relief, and there’s not much time spent on the internal conflict that is such a big part of the coming out process. It’s not especially realistic or nuanced, but All-New X-Men isn’t Alison Bechdel’s Fun Home. Bendis writes a fantasy version of coming out, one that is smooth and easy and psychically assisted. He’s not all that concerned with how this revelation rocks teenage Bobby—who comes to terms with the truth very quickly—but with the questions this introduces for adult Bobby, and there are a lot of them. Teen Bobby coming out gives Bendis the opportunity to bring adult Bobby into the plot, and it will be fascinating to see two versions of a character sit down to talk about their shared sexuality. That’s the kind of conversation that is possible in superhero comics, where anything is possible. There are some questionable elements about the coming out scene, but Bobby being gay isn’t one of them. Bendis has dropped hints throughout his run that teen Bobby is attracted to men, and the present-day Bobby has had consistent trouble maintaining romantic relationships with women. But difficulty having straight relationships doesn’t make a character gay. Is adult Bobby bisexual? Can he be bisexual if his younger self identifies as gay? These are intriguing questions, and some readers are frustrated because this issue doesn’t answer them. But this is just the beginning of the story, and it’s the kind of story that is perfectly suited for the X-Men. This is a property that is all about embracing your identity in a world that hates and fears you, and when fans lash out against these types of changes, they become the very thing the X-Men fight against. People come out late in life all the time, many after being in straight relationships, so Bobby being gay isn’t that far-fetched. Certainly not as far-fetched as a teenage boy having a special mutant gene that allows him to turn into ice. But there are some readers that feel a sense of ownership as they spend more time with these characters and invest money into their stories, which leads to outrage when changes are made that don’t jibe with the imaginary characters that exist in these readers’ heads. If Marvel wants to make Bobby Drake gay, that’s Marvel’s decision to make. Now the publisher has the responsibility of reconciling this revelation with years of history for adult Bobby, and if it drops the ball in that respect, then it deserves any backlash that comes its way.